Looking for an unmoderated platform? Peepeth may not be what you're looking for. Like almost all other platforms, Peepeth is moderated (see the terms of service). Data happens to be stored on the blockchain, but Peepeth is not an anything-goes platform. For an unmoderated experience, see Gab.ai or Minds.com. Read more. Peepeth promotes mindful, responsible, self-aware speech. Features encourage mindful engagement & positive contribution. Peepeth encourages you to think before you post or "like", support charity, and learn more about yourself. No ads: Peepeth doesn't optimize for ad impressions (which introduces perverse incentives for platforms who do). Data is saved to an open, public, and permanent database (the Ethereum blockchain). Anyone can make an interface for Peepeth's public data. Is Peepeth.com uncensorable? Peepeth.com's public datastore is immutable, but it is not an "anything goes" platform. Posts that violate the terms of service will not be shown. Learn what this means. 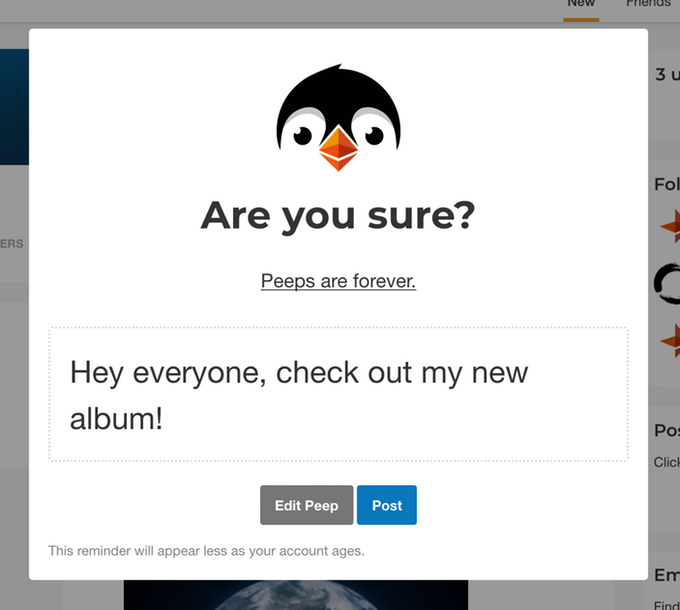 On Peepeth, accounts and posts (“peeps”) are stored on the blockchain. That gives you exclusive control over your account and content. No intermediary is required for you to post or access data. Peeps are publicly accessible, potentially forever. This creates accountability and gives your words more weight. The result is more considered peeps. All data is openly stored on the Ethereum blockchain. Anyone can monitor the blockchain to see what Peepeth.com is not displaying. Some users will be able to easily audit moderated content on Peepeth.com itself. Peepeth is spam-resistant because it costs money to write to the blockchain. Don’t worry— Peepeth foots the bill for you— but spammers lose their free-peeping privilege, making spamming a relatively expensive prospect. Anyone can start their own front-end interface that reads and writes Peepeth data (yourPeepeth.com), because the blockchain protocol is open. Accept tips in cryptocurrency (Peepeth charges a 10% fee). Verify your identity by linking your other social media accounts through the blockchain. Twitter and GitHub currently supported; more coming soon. Peepeth charges a fee in cryptocurrency for verifications. There are many other possibilities for blockchain-based services in the future. 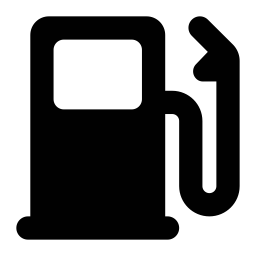 Peepeth can interact with other smart contracts (self-executing computer programs on the Ethereum blockchain) to provide decentralized services. 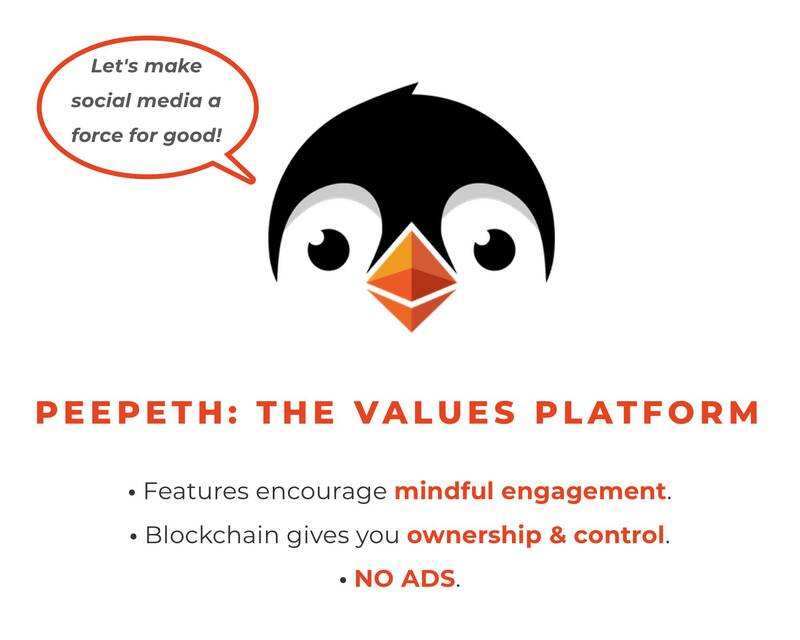 Peepeth's mission is to encourage mindful engagement and positive contribution, both online and in the world. The blockchain is only part of the story. Peepeth's features encourage thoughtful, responsible engagement, and discourage hate, spam, and reactive posts. How can we do good most effectively? Buy a charity badge to support and raise awareness for an important, neglected, and tractable problem: malaria. Your charity badge is shown on your avatar, bumps you to the top of follower suggestions, and gives you serious Peepeth-cred (among other on-site benefits). Together, we’ve purchases over 1390 long-lasting insecticidal bed nets from the Against Malaria Foundation, the top-ranked charity by several top Effective Altruism charity evaluators. Learn more here. 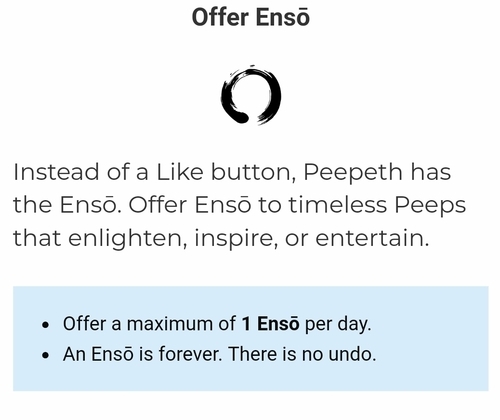 Instead of a Like button, Peepeth has the once-per-day Ensō. Its rarity makes it more special to receive, and it encourages the creation of dignified, beautiful, and timeless content. 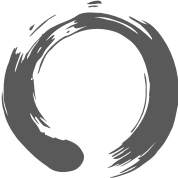 An Ensō is forever; there is no undo. The words you use reliably predict your Big Five personality traits. Learn more about yourself by having powerful artificial intelligence derive your personality traits from your public peeps, and compare your results on Peepeth to your other social media accounts. Keep your results private, delete them forever, or display them on your profile. This feature is a fun way to learn more about yourself, and to find others you might be interested in following. It's an optional paid service. Insight credits can also be gifted. One credit entitles you to perform this analysis on your peeps or on your content on another public social media account. Learn more here (in development). Peepeth periodically reminds you to review your post before committing it to the blockchain, resulting in fewer typos and greater reflection before posting. Peeps are forever. Reminders give you a chance to reconsider. (In development) Many people find online political discussion frustrating and stressful. On Peepeth, users are urged to include the #politics hashtag in political peeps. This hides the content (but not the peep) by default (users must click "reveal"), giving users the freedom to ignore potentially toxic discussions. This is an evolving solution to a tough problem. You can pin a peep to your profile. Unlike Twitter, however, you must pin someone else’s post (not your own). Peepeth is just getting started. There are other novel features in the pipeline. Is Peepeth scalable? Will it clog the Ethereum network? Peepeth has pioneered innovative techniques to batch content in a small number of blockchain transactions. No matter how many users it has, the core functionality will execute a constant number of transactions (not including other optional blockchain features). Check this for more (including pronunciation)! Is Peepeth “Twitter on the blockchain”? Peepeth may look similar to existing services, but Peepeth is fundamentally different because of its use of the blockchain, its focus on encouraging positive contribution, and lack of reliance on ads. Peepeth optimizes for thoughtfulness, self-awareness, and charity, not ad impressions. Peepeth's back-end is open and immutable. Peeps are forever; which encourages more thoughtful posts. Peepeth doesn't control your account or content (you do). Peepeth.com is moderated. It is not a neutral “anything goes” platform, despite the immutability of its datastore. The emphasis here is on cultivating mindful engagement, positive contribution, and self-awareness. Peeps that are not in accord with the terms of service will be removed, by default, from the main feed. Moderation is transparent on Peepeth.com, because of the open nature of the blockchain. That keeps Peepeth.com accountable to users, who are free to build and use another front-end for Peepeth data. Like nearly every other site, Peepeth.com is moderated. Peepeth's datastore (the blockchain) is immutable, but Peepeth.com will not display content that violates its code of conduct. The blockchain keeps Peepeth accountable to users. The blockchain creates trust through openness. Anyone can audit Peepeth's public data. Peepeth's transparency and accountability to users differentiate it from other platforms. Unfortunately, censorship resistance is often misinterpreted as Peepeth's sole raison d'être. It is not. Rather, Peepeth's focus is on cultivating mindful engagement and positive contribution (read more). The censorship resistance of the blockchain plays an important part in that, albeit a nuanced one, and is not the end in itself. Confused about what Peepeth is all about? Learn more here. Looking for an unmoderated experience? Check out Gab and Minds. Can Peepeth be used for criminal purposes? Peepeth’s criminal appeal is limited. Pairing payments and communications on the same channel reveals more info about criminals and their networks than non-crypto communication channels used with crypto payments. Pairing communication and money removes a level of anonymity because of the traceable nature of blockchain transactions.